Kokoronashi EOPM is provided for you and if you think it can be optimized such as adding the dynamics etc, welcome to provide us with the more perfect Kokoronashi EOP and EOPM! 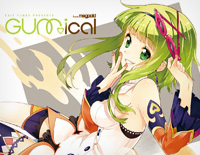 Kokoronashi is a song performed by GUMI, a Japanese VOCALOID developed and distributed by Internet Co., Ltd. And it has been featured on the EXIT TUNES compilation album GUMical from Megpoid as well as the album End of the World. This song has entered the Hall of Fame.